Hyde Hall's Winter Garden, which opens in winter 2018, has been designed to show that gardens can look spectacular even through the coldest months of the year. The Winter Garden celebrates seasonal change, from its autumn display of foliage and berries to the colourful stems and skeletal seedheads of the colder months, and it is a wonderful source of ideas for your own garden. Striking plant combinations include the glossy leaves of Viburnum odoratissimum underplanted with the contrasting yellow foliage of Acorus gramineus ‘Ogon’. Cornus (dogwood) offers wonderful variety and winter colour, with stems ranging in hue from white through yellow, orange and red. The Winter Garden features around 100 different types of Cornus , which will be monitored as part of a RHS Trial to establish which varieties perform reliably. Colour and texture are also provided by the herbaceous plants with seedheads and stems that remain though winter adding a variety of colour and texture - like the perennial grass, Pennisetum alopecuroides 'Cassian's Choice' pictured above. The golden haze from Deschampsia cespitosa ‘Goldtau’, meanwhile, seems to float among the seedheads of Liatris spicata ‘Floristan Violett’, Amsonia tabernaemontana and the silvery foliage of Anaphalis triplinervis ‘Somerset’. Whatever the time of year, the RHS Gardens make a great day out. 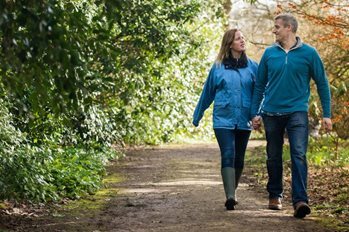 As well as the stunning gardens, we offer special walks, talks, and events for all ages.